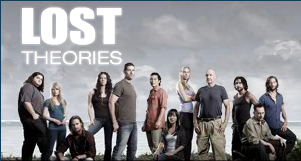 i have a confession to make: the season premiere of LOST snuck up on me this year. i’m usually counting down the days, weeks ahead of time, but this year, whoa… it’s just here. perhaps it’s because i’m preoccupied with other things (like the fact that i’m due in 6 1/2 weeks and i have a ton to do before then), but now that my friend christian sent me an email with a sneak peek for tonight, i have to say, I’M SYCHED. no show in the entire world can pull me in like LOST does. no one is allowed to talk to me during this show. if you call or text me, you will be ignored until after it is over. i know that sounds a little harsh, and i’m sorry, but considering i’m losing my mind anyway i figured i have to pay extra close attention now as to what is going on. – i know i said that jin died, but i’m almost wondering if he was just thrown off the boat by the blast and then got picked up by daniel faraday and the other people who were on their way? hey, it could happen. haven’t you seen joe versus the volcano? the volcano blew them out, so we can keep our fingers crossed. plus, sun needs a happy ending in my book. – locke turns crazy. wait. this already happened. – charlotte. ya know, i’m wondering if this is annie? but i think ben would have known that, and when he went through her entire history at the beginning of the season i think we would have had a clue. but she said she was looking for where she was born. we never did see what happened to annie, so there’s a chance. – juliette and sawyer become sawliette. i mean, how obvious is it? ben’s gone, so he can’t kill sawyer, and kate’s gone, so juliette can take her place. it’s perfect. – somehow the oceanic 6 gets back to the island. (besides, ben has a plan… duh) next season will be their journey to get there with the finale being getting there. meanwhile, i think we will see some island action. and my newest prediction: when locke moves the island, the island goes back in time. in the previews it looks like yemi’s plane crashing, and people in those yellow suits are there as well. 1- who died? while i was right about michael and jin, i have to admit i was really surprised that des didn’t kick the bucket. lost just doesn’t let a couple finally be happy together, so as much as i loved seeing him and penny reunite, i have charlotte’s eery statement in the back of my head that “nothing is forever.” enjoy it while you can i guess. penny’s gonna have to hide from daddy for the rest of her life, and maybe that’s why charles widmore told ben that he wouldn’t be able to find penny… her own father didn’t even know where she was. but back to the whole people who did die… i felt horrible that jin didn’t make it. i really thought that he would save the day and figure out how to cut the bomb off. i’ll tell you one thing though, sun needs at least an emmy nod for that reaction. 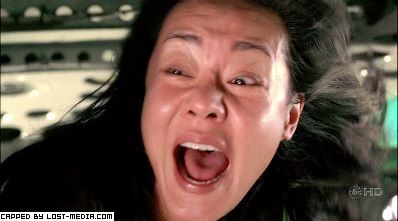 that scream sent chills down my spine to say the least. and keamy… yeh i could care less about him actually dying, but the whole “dead man’s trigger” thing was unreal. i wasn’t quite right about him getting mad and triggering it himself, but at least i did figure out that it was the trigger. yesssss…. and how bout ben going ballistic on him? crazy. crazy ben. crazy. 4- the whole claire thing. okay, lost usually doesn’t scare me, and perhaps it was because david was out of town and not there watching it with me, but can i get a show of hands as to how badly claire freaked me out? ahhhh i get chills still just thinking about it. the music in lost makes it though. hats off to michael giacchino for the score. bling! waaaaaaaaahhhhHHHHHHH!!!!! BOM! (that was me trying to sing it for you on here. did it work?) anyways, i’m still stickin to my theory. she’s dead. she’s not only dead, she’s super dead. but she doesn’t want kate to bring aaron back because he “must not be raised by an other.” i’m itching to find out what “horrible things” happened after they all left…. according to what jeremy bentham/locke told jack. i doubt they were all jack’s fault, but whatever. we’ll see. 5- jacob. really no mention of him besides the whole move the island thing… then ben’s cute comment. 6- christian shephard. yep, he made his appearance. jack didn’t see him though. and i bet he’s glad he didn’t, cause he would be blown up just like michael. 7- locke’s phrase. wow, none in the episode. i did enjoy jenn’s comment of “8 times less than hurley says dude!” classic. 8- ghosts. claire and christian, like i said. and i really was hoping that the man coming down the elevator in the orchid was marvin candle, but i was wrong. only on the video tape. speaking of the video tape, how ironic was it that the whole tape about time traveling bunnies started to rewind itself (and go back in time)? just a little something to snicker about. clever, producers. clever. 9- how it ended up. i saw on good morning america that they had to tape three different people in the casket, so even no one in the show knew who it was gonna be until the episode aired. one was locke (obviously). the other two were sawyer and desmond. i thought it was interesting. and the island moved, so they couldn’t get back which was predictable. all in all, i must say i was not disappointed in this finale. it was unreal, and i’m still trying to think everything out in my head. welp, that’s all i have so far. until next season, stay lost. okay… LOST predictions by el doubleyou. 1. Will anyone die? If so, who? Well, what Lost finale is complete without someone dying? My predictions: Jin, Michael, and (sorry to say) Desmond. My reasoning for Jin: Sun told her father that he was one person that was responsible for Jin’s death. I don’t think she would have gone that far to cover it up if he was really still alive on the island. The other person? Keamy. But I’ll get to that later. Reasoning for Michael: By the end of the episode, the island should be done with him and allow him to die… Reasoning for Desmond: He finally got to tell Penny he loves her, and she to him, and we all know that when a character finds redemption on this show, it’s sayonara… as much as I hate to see him go. Plus, he said he would never go back to the island, and he’s not with the Oceanic 6. So, I think that the freighter will explode, and these three (among random others) will be on it when it does so. 2. Will we see how the Oceanic 6 get off the island? If so, how do they all come together? Yes. Here’s how: So, Ben distracts Keamy and his men, Locke goes into the Orchid, Hurley is by himself as the others and Kate and Sayid walk up. While the others work to get Ben away from Keamy, Jack and Sawyer swoop in, grab Kate, Sayid, and Hurley, and meet up with Frank, who flies them to the freighter. Keamy sees them fly off, then starts the timer to the explosives on the boat by the crazy contraption on his arm cause he’s mad. Jin and Michael see the timer going, make the Oceanic 6 get on the raft, the freighter explodes, and the Oceanic 6 are found by the coast guard, even though they were trying to get back to the island. More on that for the last question. 3. What happens with the frieghties and Ben? Of course Ben somehow escapes… probably with the help of the others. The freighties are stuck now on the island since Keamy blew up the boat, now there is a whole new war stewing on the island for next season. 4. Will we gain understanding of the whole Claire leaving Aaron behind and disappearing scenario… and smiling about it? Of course we will. Claire is dead. We do not find out until this episode, so I’m not sure if that really counts to include in my number one answer. Here’s how: she had internal bleeding from her house exploding, saw Christian Shephard when she was going in and out of consciousness, then followed him and died somewhere. They will find her body in this episode. It’s the only thing that makes sense as to why she saw Christian and why she was acting so weird. 5. Will we find out who Jacob is? While I would normally be like, Yeah Right, like that will really happen, I actually do think that we will gain a little insight. Like I said before, I think that Locke is a huge part of this… and Jacob needs Locke to survive. 6. Will we see Christian Shephard? (Will Jack see Christian Shephard?) Yup. I agree with Christian Pruitt’s comment on this one: We will see him and Jack will get to talk to him. 7. How many times will Locke say “Don’t tell me what I can’t do!” At least once, no question. He might push for two. 8. How many ghosts will we see, if any, and who will they be? As much as I would love to say that Charlie will show up, I really don’t think he will. Lists of ghosts for this episode include only Christian and Claire. And I don’t know if Marvin Candle is a ghost, but I think that Locke will see him in the Orchid, whether by video, ghost encounters, or the crazy man has been living there the whole time maybe. He always appears in a new station somehow, why not take a long shot? 9. How will the finale end up? I don’t know about you, but if this episode does not show us how the heck Locke is going to move the island, I’m gonna be disappointed. Not fully, but disappointed nonetheless. This goes back to explaining why the Oceanic 6 actually got found… the island wasn’t there anymore. Locke was successful in moving it, so they couldn’t find it and it made it easier for normal people (like the coast guard) to find them. Then I think that it will end up with bearded addict Jack yelling at Kate that they have to go back. But oh no, Lost will not leave us there. There will be one more scene. This scene I cannot predict. I do not want to predict it… I want it to leave me like last season’s finale did: wide eyed, open mouthed, and dreading having to wait until next season to find out what that was all about. so, there you have it. sure, there may be some long shots out there, but what good is it not to play along and let everyone know your crazy theories? hey, i might even get some right this year. until next time, stay LOST. okay, i’m posting my predictions after lunch today, so if you haven’t made your predictions yet, go ahead and make them. they can be short answers, i just want something. anything. okay. go. okay all you LOST fans out there, i’m opening it up. the rest of the finale airs tomorrow night, and i’m curious to see what everyone’s predictions are going to be. so get ready. here are the questions. YOU MUST PARTICIPATE. uh… please. 1. Will anyone die? If so, who? 2. Will we see how the Oceanic 6 get off the island? If so, how do they all come together? 3. What happens with the frieghties and Ben? 4. Will we gain understanding of the whole Claire leaving Aaron behind and disappearing scenario… and smiling about it? 5. Will we find out who Jacob is? 8. How many ghosts will we see, if any, and who will they be? 9. How will the finale end up? So… take your time, type your answers. I’ll be coming up with my own as well, and post them tomorrow before it airs. Happy theorizing! my friend daniel has a theory about lost… he thinks that the reason the show is called lost is because anyone who tries to watch it is going to feel lost during the show. while i usually think, nah, daniel’s just lost because he hasn’t kept up with it, i must admit that the thought did go through my head last night while i was watching a nonchalant claire in the cabin that i thought, “hey, maybe he has a point. i’m lost.” …. but i’m getting ahead of myself. let’s start from the beginning. let’s talk about john locke. 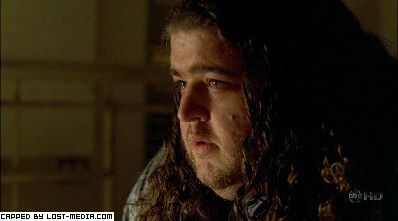 lost has a habit of making you question whether or not you have it on the right channel at the beginning of some episodes. last night was no exception. we see emily dancing to buddy holly (ah oh ah oh) before going out on a date with a much older anthony cooper… then she gets hit by the car (which i wonder if it’s anthony that actually hits her?) and the next scene is a hospital, where the skinny girl tells the nurse that her eggo is five months prego (thank you juno) and she has the baby. (p.s. i hope i look like that when i’m 5 months pregnant. wow.) so… long story short (too late) it’s john locke. even though he’s super premature, he makes it, but emily gets scared and runs away, and her mom decides to put him up for adoption. and, as chill bumps make their way to me, we see richard (looking the exact same age as he always has) watching this whole thing. what’s even spookier? the mom looks as though she recognizes him. i may be crazy, but the thought did go through my head, hmm… maybe he’s locke’s father? it drives me crazy that he never looks like he ages, but get this: what if richard is just using the time travel thing to his advantage? not that i am even beginning to figure out how it all works, but hey, it’s an idea. and that brings us to time travel (again). no doubt that this theme has tons to do with lost, and since i have no idea about time travel things, it’s making it harder for me to figure things out. this is the first time that i actually noticed something going on with time travel as we are actually watching the episode: the doctor. i knew i wasn’t losing it… in the freighter time, the doctor was not dead yet. the morse code message could be heard coming from the phone, so that let us know that the island was ahead of the freighter. now it’s understandable that the lostees thought it took forever to hear from the helicopter that took desmond and sayid. hmm… my head hurts. i only have one more thing to say about the time thing, and it might have something to do with time travel and it might not, and maybe i’m really reading into things, but here’s a question: when horace was talking to john, he said he had been dead for 12 years. this didn’t make sense to me. 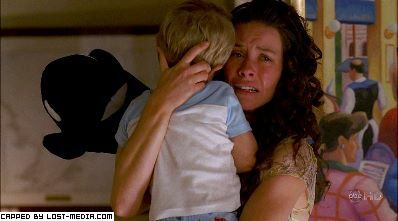 i thought the whole dharma purge thing had to have happened more than 16 years ago, because i can’t imagine that ben would go steal alex away from danielle while he was still in the dharma initiative and no one question it… unless he stole her, left her with one of the natives, and came back and claimed her later on? but that would make alex 4 and… i just don’t get it… it doesn’t add up. and it was strange to me that horace’s nose was bleeding like the time travelers do when the jump time… but it was a dream of locke’s, right? so does it even matter? 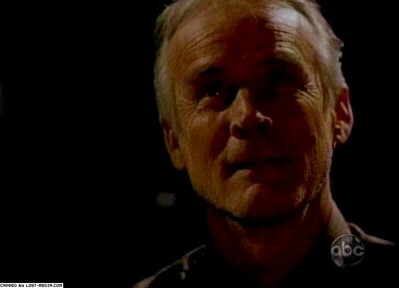 1- the island is still not done with michael, since someone else can’t even kill him. dude just can’t catch a break. 3- i think that locke is the new jacob. did you realize that the first time that locke saw the outline of jacob it kinda looked like locke? then the eye in the cabin that hurley saw looked like locke. and that’s why locke hasn’t seen him since… it’s kinda hard to look for someone when.. um.. you’re him? crazy, i know. but still, it could happen. 4- we finally see that widmore and dharma really do have a connection from the whole protocol book that keamy uses to see what he’s supposed to do next. ready for my theory? i think that charles widmore was somehow involved with the dharma initiative, found out what ben did when he killed everyone, and now he wants his island back and wants to get even with ben. 5- how many times has john locke said “don’t tell me what i can’t do!” in his life? gah, it’s annoying. i’m sure it has a purpose though. 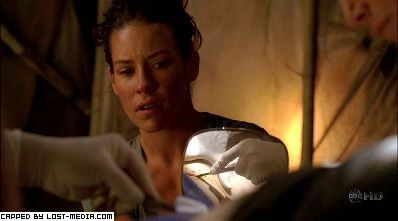 7- i was bummed when the captain died. he was pretty cool. 8- now back to claire. i’m guessing this is how kate got aaron. i don’t really get how claire was acting though. i don’t think it was really her. first of all, she never liked christian shephard, and would have never called him dad. second of all, aaron was everything to her. she wouldn’t just leave him in the jungle and go off with “daddy.” i don’t know if she was drugged or that just wasn’t her, but something is obviously off. what? i dunno. 9- was it just me or did christian shephard look really old and scruffy? 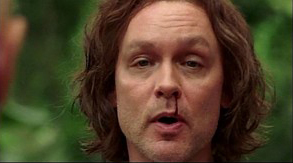 this episode of lost left me with mixed emotions. obviously, i was super excited to see that it was kate and jack together, but it made it all the more heart breaking when we started to see the decline of jack. i do have some points to make about this episode though. – how stubborn is jack? stubborn enough to let his appendix burst and die? seemed like it to me. i don’t understand that. i think he still doesn’t truly trust juliet either. which is why he wanted kate in there (other than the fact that he loves her), and then wanted to stay awake while she dug around in his abdominal cavity. seriously, who does that? take it like a man and just go to sleep jack. 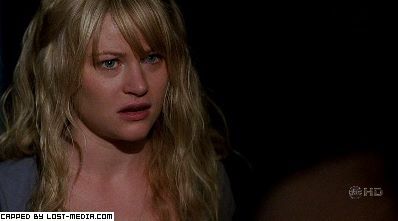 – how upset is juliet about the whole realizing that jack loves kate instead of her thing? i gotta hand it to her, way to make him feel bad in the end by saying that to kate while knowing he was awake. and then i gotta give jack props for not squirming while she was sewing him up… but, ya know, if you can handle watching someone carve into your gut i think you can handle being sewn up afterwards. but that extra “jab” from juliet had to make him feel even more like crap. – the secret phone call thing. you would think that kate would no longer be sneaky, but i guess some things never change. then we find out at the end that she was doing something for “him”… as in… sawyer. and i’ll put money on it that it has something to do with his daughter, clementine. kate already knows cassidy, the mama, anyway from way earlier. i wonder how all that came together? – something is telling me that the whole “you’re not even related to him” comment in the end is a way of almost revealing that jack eventually found out about him and claire being half siblings. at the same time, that was pretty harsh, jack. if aaron could have understood you that would have been bad, but i’m guessing he’s only around 2, maybe 3, so it could be possible, but not too likely. – what is up with christian shephard’s ghost? what is going on? did he somehow kidnap claire, and maybe that’s how kate ends up with aaron? i’m sure we’ll find out at some point…. but not next week. it never works that way.